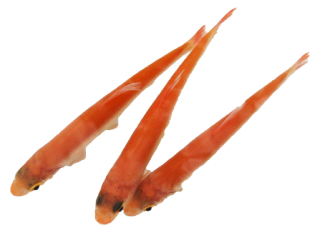 The ide belongs to the cypriniformes. 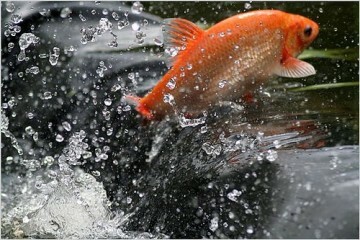 We can not imagine our pond without ide fish. This is not astonishing, if you see how active an ide fish is present on the water surface. Besides, ide fish do not grub in the bottom and they will hardly eat from plants. Ides are a growing form of fish which originate from Europe. In a pond an ide will to a size ranging from forty to 24 in long. Their weight is maximum 4 kilograms. They can grow about 15 to 20 years old. Ides are real school-fish, which should be kept with at least five specimens. In contradistinction to a goldfish, for example, a gold orfe is a real surface fish, by which it attracts attention. If a pond is deep enough, at least 40 in, they will easily hibernate in winter. They are not extremely sensitive to parasites, however, they are for water quality. That is the reason why an ide is also used by water treatment plants in particular systems, so that one can see the quality of the water is right or not. The need of oxygen of an ide is more urgent than that of goldfish, for example. Consequently it is important that, if you buy ides, they will be introduced to a pond as quickly as possible. However, once in a pond an additional oxygen pump or a fountain is very important. Especially in plant ponds, where plants will withdraw oxygen from the water at night, this may lead to problems sometimes, if no measures would be taken for additional provision of oxygen. For ides balanced feed is available, which is easily digestible. Owing to their colour scheme ides are clearly visible, for example, for herons and cats. The are different animal-friendly solutions to protect your orfes against these and different hunters.